You hear all about Israel wanting to remain a "Jewish State." Or, the media refers to Israel as a "Jewish State." What does that mean for a democracy? What does that mean for minorities? What is a "Jewish State," after all. What it means is that the population is Jewish, and the population identifies itself as Jewish. A Jewish State is a cultural term, meaning that these people walk, talk, think, act, and speak like Jews. Well, the natural question is, what does that mean? It can be a religious thing, that we as Jews see ourselves as Jews, that we are the people that G-d chose to live in this land, to keep his Torah and laws, to be the 'light to the nations.' It can also be a nationalist identification. That we see ourselves as Jews, in the sense that we are an ethnicity. Just like a Japanese person would say, "I am Japenese, and my people are ethnically Japanese, based on our language, food, shared history, religion, and cultural cues," a Jew in Israel would say "Our food, our language, our religion, our history, our culture, our nation..."
So, when I walk around, with these types of things on my mind, the types of things that really brought me to Israel -- the beauty of transitioning from an embarrassed Jew to a proud one, the natural feeling of being a Jew in his land, the knowledge that we belong here, and belong to each other -- I walk around and have these things on my mind, and instead of them slowly slipping away as mere idealism, as idealism seems to do, they are reinforced in my daily life. That's because this isn't just a Jewish place due to everyone being Jewish. It's Jewish because we embrace it. If I could have frozen time, I would have taken pictures of all the 13 year old, secular, teenage punk girls and boys, all wearing Stars of David. Just riding on a regular old city bus, on any old day, what do I see? Grafitti. Typical. But, not your normal grafitti, or at least not normal anywhere outside of this country. In this country, this is pretty much everywhere. If you're a Jew, you'll know what it feels like to see this randomly penned in America (and anywhere else, as far as I assume). 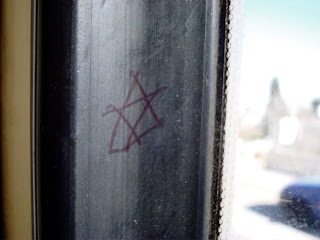 To see this in this country, with all that young idealism in your head... Just a tiny little star on the sill of a bus window, a German bus, nonetheless, and your difficulties just seem to melt away with the ethereal sun. Just #247 of the reasons I love this country.